The obesity debate rages on. Nevertheless, some clever bod over at McDonald's has decided to introduce the fast food giant's highest calorie menu item ever. Unfortunately for all those smacking their chops at the thought of tucking into this glistening golden pile of potato (and oil and dextrose), the Mega Potato will - initially - only be available in Japan. Launched in restaurants across the country today, the sumo-sized portion of fries will retail for 490 yen (£3.20). The limited edition serving of chips is double the size of the current 'large' portion, containing a stomach-churning 1,142 calories. That's over half the entire recommended daily calorie intake for women. Compared to other staples of the McDonald's menu, the Mega Potato is a monster. Large french fries contain 460 calories; a plain hamburger just 250; the double cheeseburger 440; the sausage and egg McMuffin has 430. Even the Big Mac contains a relatively puny 490 calories. 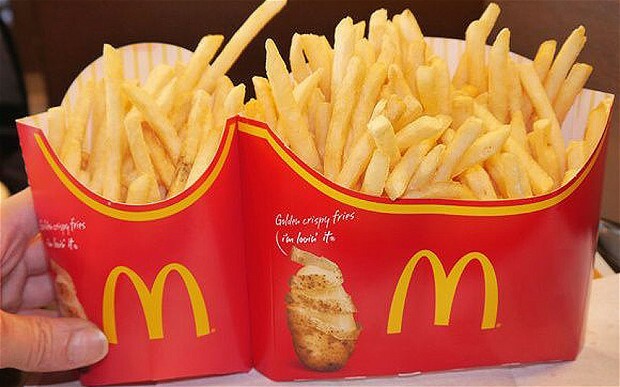 McDonald's insists that the Mega Potato has been introduced as a 'sharing option'. But if these supersized fries make it to our shores, MT reckons it could replace the McGangBang (a Chicken Mayo inserted inside a Double Cheeseburger), as the competitive eating choice for drunken louts and rugger buggers across the UK.